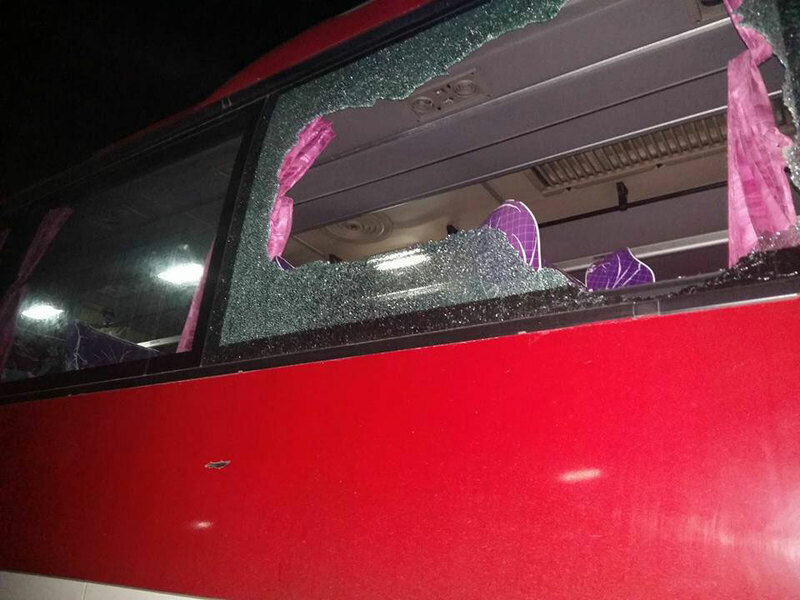 Window of passenger bus attacked by gunmen in northern Laos, Jan. 14, 2016. Unidentified gunmen shot up a passenger bus in northern Laos last week in an incident that officials and witnesses said was the work of bandits in an attack that was thwarted by the actions of the alert driver. The midnight attack on Jan. 14 on Route 13 North in Kasy district, 175 km (105 miles) north of the capital Vientiane, left one of about a dozen passengers in the vehicle injured, but caused no deaths. “While the bus was moving up a hill, the bandits fired about 50 shots at the vehicle. At first they shot front of the bus, then the side and back of the bus,” said a passenger who was on the bus when it was attacked and spoke to RFA’s Lao Service on condition of anonymity. “The driver sped up the bus after he realized the bandits were shooting at us,” added the passenger. The bus, which was plying the route between Vientiane and Luangnamtha province in northern Laos, was attacked at Namkhean village near Phoukhoun Mountain, he added. “At first I heard the front window breaking and thought it was the explosion of a tire,” said the passenger. “Meanwhile, the driver steered the wheel away from the shooting and passengers fell out of their seats,” he said. An official in Kasy district said the local government had “heard of the incident” but had not officially confirmed it. Police are investigating, he added. “This was done by a group of bad people who might be ordinary robbers, because no one was killed,” the official told RFA. The bus attack in Kasy follows a series of attacks on vehicles passing through central Laos that were revealed to RFA by a retired Lao soldier. In the first incident on Dec. 15, 15 bandits shot two motorcyclists in the Anouvong district of Xaysomboun province, killing one and injuring another. In another incident three days later, bandits shot at a truck transporting beer in Anouvong district, injuring two people in the vehicle, one seriously. Xaysomboun Province had imposed a curfew last month after a spate of violence in November which three government soldiers and three civilians were killed, according to police and other sources. Reported and translated by Ounkeo Souksavanh for RFA’s Lao Service. Written in English by Paul Eckert. They are people from the hill. Terrorism people who hate the Lao PDR Government. I believe these so-called "bandits shoot ups" are all done by the commi lao officials as a mean to strike fear and control over its people. The corrupted commi lao govt. and its officials are well known for such acts. Lao soldiers killing its own civilians and blame it on the anti lao govt. Rabel group. Lao govt. and its officials should be ashamed of themselves for such acts. Laos people are all stupid. The old regime and new regime done nothing for the people. Why does Laos still living in the 1800s? No they are not Bandits They just hate LAO COMMUNIST SELFISH GOVERNMENT and you bet They will step up to make it Big.You are done LAO COMMUNIST GOVERNMENT, You will be LAO COMMUNIST REFUGEES sooner or later in North AMERICA and a lot of Lao people who live here want to SPONSOR YOU ALL.